It’s called H type because the runner shape from the top similar with “H”, it’ use in both circular layout and rectangle layout system, in circular type the runner doesn’t similar with H but it more similar with fork, circular type use in various type of product, like gear, cylinder shape, etc. 2.When designing the runner, runner volume is made small as possible, this type is smallest than two type runner before. 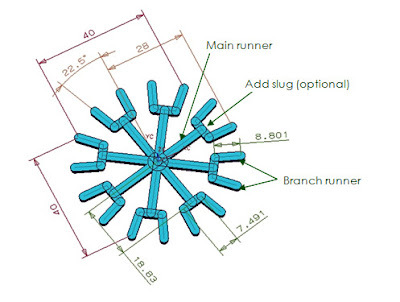 3.All the cavities fill at the same time possibility is high, balanced runner have an equal flow length and runner size form sprue to all cavities also same, so that each cavity can fill in nearly condition.